The Ironwood Grill is in Plymouth, Michigan and it is located where the old office supply shop was in the downtown area, but it like most of the storefronts in Plymouth has become a restaurant or a tavern. I had heard on the radio that they were going to begin catering to a couple of cinemas in the metropolitan area, so we decided to have a meal there. I guess I am old fashioned, but since I do not watch television at home, I find it distracting to see multiple screens when I go out to eat, but that seems to be the norm today. Since most couples that are eating, are either watching television or engrossed in their telephones, dinner conversations seem to have become another relic of a bygone era. The restaurant bills itself as a Smokehouse, as so many do these days as an alternative to saying barbeque, which is fine. In fact my Bride ordered a Pulled Pork Dinner and it came with a couple of side dishes and sides I guess means very small portions. My Bride enjoyed her meal, though I felt that it was a bit on the dry side, but then I am not a fan of pulled pork. I chose a Gumbo for dinner, because I felt like having something spicy and a bit different, and I was channeling past memories of the French Quarter in New Orleans. While the Gumbo was tasty and had good flavors, it was more of a soup, compared to a Gumbo, the broth had not been reduced, or if it had not by much. I guess that I was out of the loop, as to what to expect, as this restaurant was packed. In fact it was packed, when we got there, and we had to wait for a table, and when we left there were plenty of people waiting to for the chance to get a table as well. 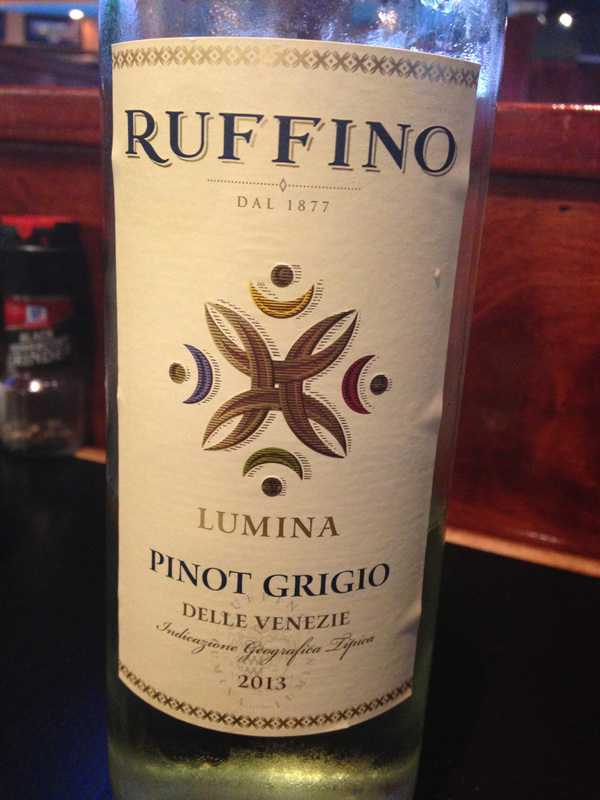 My Bride had a glass of Ruffino Lumina Pinot Grigio Delle Venezie IGT 2013. When one thinks of Ruffino the thought of Chianti immediately comes to mind, especially the Riserva Ducale Oro. This wine was done in Stainless Steel and it was not as crisp as I had anticipated that it should have been, but when it was paired with the pulled pork it was much more appealing. 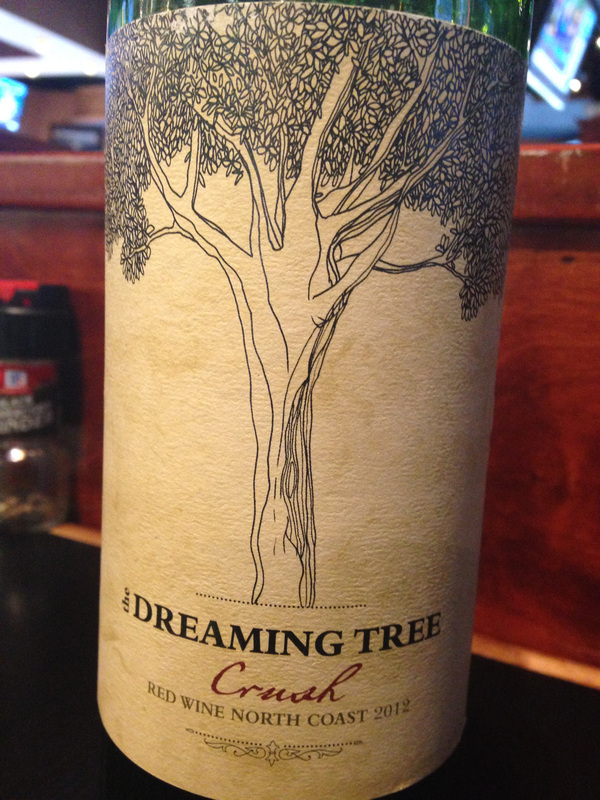 I had a glass of The Dreaming Tree Crush 2012, which is a red proprietary blended wine with a North Coast AVA. I immediately tasted Zin, and when I looked up the wine, I was surprised to see that it was Merlot, Zinfandel, Petite Sirah and 8% other. While the Merlot was in the majority, it was the Zin that really came through to me, which was fine since I was having a spicy entrée. I think that I will try this location again, since it was so busy, and perhaps I just had an off day. This entry was posted in Dining, Wine and tagged California, delle Venezie IGT, Italy, Lumina, Merlot, North Coast, Petite Sirah, Pinot Grigio, Ruffino, The Dreaming Tree Crush, Zinfandel. Bookmark the permalink.